A fun music group for kids and their carers. 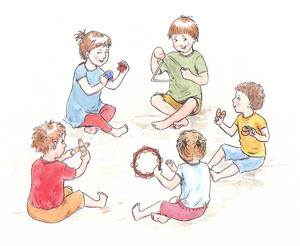 DynaMites is a musical playgroup for children aged 0-5 with their carers - mums, nannies, grandmas, grandpas - all are welcome. We have fun singing, dancing, playing percussion instruments, hearing a Bible story and singing songs with the parachute. Music is followed by morning tea and then an optional Bible discussion group with free child-minding provided.